Not the most vintage or modern Tele in Fender's range, this is nonetheless a thoroughly competent modern Tele: plug in, play. Build quality; player-centric upgrades; mainstream feel; playability and sounds. Veers towards the Strat's design with ribcage contour and six-saddle bridge. 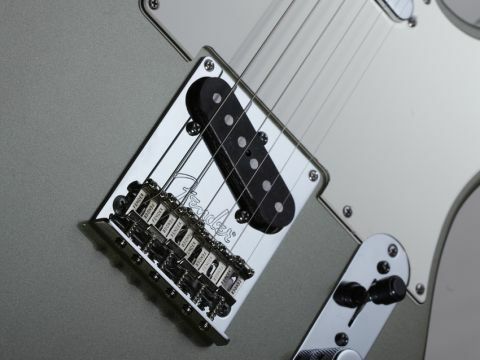 The new Telecaster Standard retains the Strat-esque six-saddle bridge from 2008. The Tele's Strat-like ribcage contour may be a step too far for some purists. The main updates for this year's American Standard Tele are new pickups and aged (off-white) plastic parts. More minor changes include a thinner undercoat to the urethane body finish and a light tint to the maple neck. It also features new, longer-than-vintage string-slot holes in the bent-steel bridge saddles - a minor change but one that should ensure the string passes from its anchor hole to the dome of the saddle without impediment. "The spike of the bridge pickup is still such a great classic rock rhythm tone, while the softer, fuller voice of the old-school neck pickup always sounds surprisingly good with a little clean gain boost." The previous American Standard range update (2008) saw the Telecaster fitted with a six-saddle bridge - and here they're placed on an open-sided brass bridgeplate. New to this 2012 Tele upgrade, however, is the Strat-like ribcage contour, altering the usually slab-bodied form, and our sample comes in the new 2012 colour addition, Jade Metallic Pearl, inspired by Lexus no less. Don't expect a vintage handful of neck. In terms of profile we have Fender's modern 'C' which, combined with the flatter-than-vintage radius (9.5 inches instead of 7.25 inches) and well-dressed medium jumbo frets, makes for a very playable mainstream feel. Depth-wise, it measures 20.9mm at the first fret and 22.5mm at the 12th. The rosewood fingerboard, unlike the maple fingerboard of the Stratocaster, has no finish covering. As a result, there's slightly more fret height and you notice the slightly rounded fingerboard edges more. Tone-wise, the most major change here is the inclusion of Fender Custom Shop pickups. There's a flush-poled Broadcaster single-coil at bridge and the popular Twisted Tele covered single-coil in the neck position, suspended from the scratchplate in modern Fender style for easy height adjustment. We also have behind-the-nut truss rod adjustment access, and on the four-screw neck plate there's the micro-tilt neck pitch adjustment system - all features that make quick adjustments easy compared with vintage-spec Fenders. What we have here is a very playable, in-tune guitar that ticks all the boxes in terms of sound without really making us go "Wow!" That's no criticism; in fact, it's an endorsement of Fender's American Standard benchmark ideal. The spike of the bridge pickup is still such a great classic rock rhythm tone, while the softer, fuller voice of the old-school neck pickup always sounds surprisingly good with a little clean gain boost. The pickup mix setting is less complex than a Strat's, but it's a beautiful, soulful rhythm voice. Compared directly with our modded '69 Telecaster, the new Tele sounds exactly that: a little brighter, a little more open (a little more Strat-like?) and slightly less mean. We have to say the ribcage contour feels more comfortable, especially seated, while the modern radius is extremely playable. Even those Strat saddles, while not ideal for nailing a real old-Tele tone, arguably make it sit better with more contemporary sounds and styles. This Fender is more than fit for purpose: not vintage-specific, or overloaded with tweaks and upgrades, just a workmanlike, well-priced, very good playing and sounding USA guitar.